-Excerpt from “Dream Coding: The Ultimate Guide To Hyper-Reality”. Recently, a friend explained to me their feelings of chaos and helplessness. As I know this person rather well, I understood what it was that was happening- also as I’d been through it myself: The Dark Night Of The Soul. The Dark Night of the Soul sounds better than it feels… it’s a complete loss of everything you thought you were. You have awoken to the simple fact that you are not real at all, but always have been living in an illusory state. You are existing, but not like you’ve previously existed- you’ve realised every tag you gave yourself was a shadow of the truth. You feel like you are falling helplessly through an illusory world that has lost any meaning it previously had, and you cannot see any ground to fall upon. The Dark Night has many connotations and the symbolism is vivid. Naturally there are as many ways to read the poem as there are journeys related to the archetypal journey we see outlined in it; but the feeling remains the same. 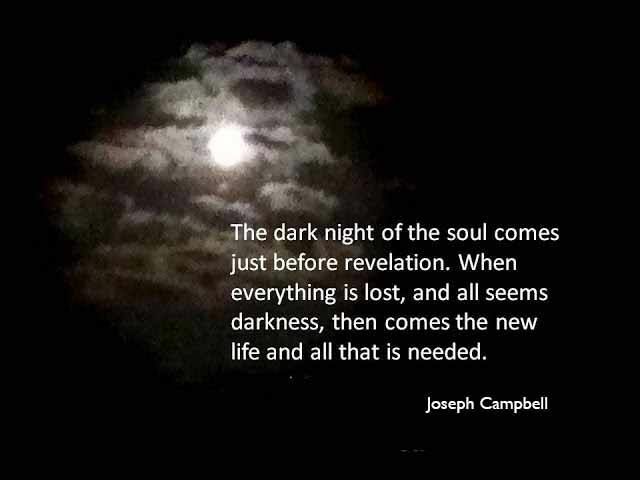 The Dark Night of the Soul often follows ones initial awakening. It can feel like reality is slipping away and your place in the world becomes meaningless. The outward signs are a lack of interest in what is going on around you, no desire to be in the world, and a feeling of inherent loss (but at what?). The inward signs are intense emotional feelings of voidness and emptiness- and are often accompanied by dreams of shadowy archetypal figures (monsters of the night). The mythical journey likened to this part of the process is that of the descent into the underworld- the dipping into the dark abyss where it seems like the hero may be forever imprisoned in the mysterious depths. Words cannot explain the intensity of the darkness that overcomes the psyche at this point- the most severe depression is minor in comparison. It is the crumbling of your existence, the complete dissolution of self. The intensity of this period is often of proportion to the trauma in ones life- those that have seen much pain and suffering in their lives will ultimately have to submerge themselves in their entire unconscious collection of pain and suffering- your own unique embodiment of living hell. It is to be noted here the distinct difference between the dark night of the soul that is bound up in a spiritual awakening to the occurrence of “clinical depression”. Each case will have to be dealt with individually but the difference will be obviously felt and identified by the individual. The major problem that comes with the inner suffering of the individual can often result in an outer world crisis. The individual may loose all interest in jobs, relationships, health and social life. Unfortunately- there is nothing that can be done to alleviate these pains. The only way out is in, in the case of this process. The Dark Night Of The Soul must be wholly experienced and felt, acknowledged and lived. This is the point where there is no rescuer- not even God. The individual must use their inner strength and power to acknowledge they are the only saviour of their own soul in this story. I think I was lucky in the fact that for me, this process seemed to last about four months- however, I understand that the period of time from an outside perspective varies; the time one spends in this phase is completely subjective and dependant on ones own individual struggle. The only advice I can give to anybody going through this is twofold. One- allow yourself the opportunity and space to feel and acknowledge this pain. Two- Know, this too shall pass. Of course- any kind of self-expression is greatly encouraged and can be extremely fruitful and productive (Carl Jungs Red Book is a phenomenal mapping of the process that he went through). It is especially noted however, that this part of the process is not wholly recognised under the branch of “psychology”, but is to be found unanimously in spiritual and/or religious philosophy so don’t always expect people in your life to know what is happening to you- as I said before, this really is on you. The strength you need to get through is only available from yourself (and this is the whole point of the process). There will come a point, where the dark night seems to lift (it can happen in one moment or gradually ease), and you will begin to feel the power of your new spirit emerging. Here is the archetypal imagery of the phoenix rising from the ashes, the exiting of the underworld, the point of revelation. The imagery of fire is often employed here as it is the symbol of “man”. In our collective biological evolution, it is the moment that man first used fire, the torch-bearer and the power over the roaming “wild” unconscious manifest. To bring back fire, one must be plunged into the fiery realm. This is a time of immense strength, courage and transformation. It is the butterfly emerging from the cocoon and the re-birth phase. It’s imperative to pause for a moment in this place to learn to gather and harness your new found strength, and understand not to run before you can walk. It is often here where people decide to dramatically alter their lifestyle and search for more clarity. This is a chance to rebuild. Often, people in your outer world will experience a shift in your personality, and this may bring some conflict into your life. However, it is now a change that has been fossilised, and the carbon has been cooked with heat and pressure to transform into a diamond in the rough. You will not be able to go back now, and the hardest part is done. Again, this process will more than likely “happen” to you without a conscious effort to obtain it. Those likely to experience this are often those on a path of healing (from physical, mental, emotional and/or spiritual trauma), or those people that are typically known as “seekers” (of truth). Obviously, one could say karma plays a role in the timing of this but I certainly know for myself, nothing I consciously did at the time triggered the process. Looking back now from a non-linear perspective, the timing was perfect, and had been triggered long before birth- but of course as ego-centric human beings we still function in a linear, time based dimension. For me, this process came about a year after my initial awakening. I was triggered in physical life by a process that rolled out in a number of dreams culminating in the dream in Part II of this book. Three days after this dream, I experienced a very real experience of death in fully conscious waking life. I felt an immediate feeling that I was going to die. At the time I was at a close friends house and my partner was also in the room. I felt pains in my back and felt the need to lie on the floor with my legs against the wall. (I can honestly say this sounds so bizarre and am thankful it happened where it did as it only could, otherwise I have no doubt I would be posted to a psychological examination centre promptly!). This feeling got progressively worse and worse for about half an hour until the point where I felt like I was completely dying in that moment. I was asking my friend and partner “what’s wrong with me? I feel like I’m dying”, and all I remember thinking was why wasn’t anyone helping me? I truly believed I was about to die and it was absolutely terrifying. I felt pain running through my whole body and felt intense buzzing. My heart felt like it was about to burst. As quickly as it had started, it began to quieten. A feeling of complete emptiness came over me and I felt completely numb like I had lost all feeling of anything. I proceeded to walk outside and sit under a tree. I just sat there feeling empty. My partner (who by now was aware that I was on some sort of “spiritual journey!”), came out to see that I was OK and stayed with me saying nothing. From there on in, the Dark Night of the Soul descended, plunging me into an abyss. A couple of years later, I now understand that this is probably what is explained as a “Kundalini Awakening” in Eastern philosophies. I came across this term and instantly understood it to be have been what had happened to me (which wasn’t of particular use after the event had all rolled out!). Always throughout the process, I have questioned my own sanity whenever these events have occurred and I have always been blessed to be around knowledgeable older, spiritually aware people that have helped to ground me at each point. If you are going through this process, know that it can only unfold at the right time in your own journey and you will always have people available that will help to ground you. For this we must be grateful and respectful to our spiritual elders who are here to pass on their wisdom. Age is transcended in the world of spirit and so it’s important to realise that a spiritual Elder doesn’t necessarily mean an elder in human years. Some of the wisdom passed to me has come from my early twenties peers, and some has come from late sixties academics! You’ll know true wisdom when you hear it as it resonates on the deepest level of your being. The following is what came out of a conversation I had with the friend that prompted this piece of writing and they kindly agreed to share their experience. I have not edited this in any way as I feel it is not my place to alter somebody else’s truth and so I hope you can see the differences and similarities in this beautiful piece of writing. Many thanks to this person for their courage in sharing their truth, and also the beautiful and raw description of their process. Please feel free to add your comments and experiences below, and anything you feel may be helpful to anybody going through this process.